•	The voting method to be adopted by the Embassy will be Automated Postal Voting. 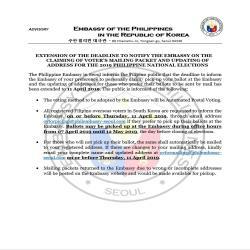 •	All registered Filipino overseas voters in South Korea are requested to inform the Embassy, on or before Thursday, 11 April 2019, through email address [email protected] if they prefer to pick up their ballots at the Embassy. Ballots may be picked up at the Embassy during office hours from 07 April 2019 until 12 May 2019, the day before closing of elections. •	For those who will not pick up their ballot, the same shall automatically be mailed to your registered address. If there are changes to your mailing address, kindly email your complete name and updated address at [email protected] on or before Thursday, 11 April 2019. 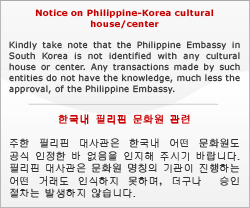 •	Mailing packets returned to the Embassy due to wrong or incomplete addresses will be posted on the Embassy website and would be made available for pickup.